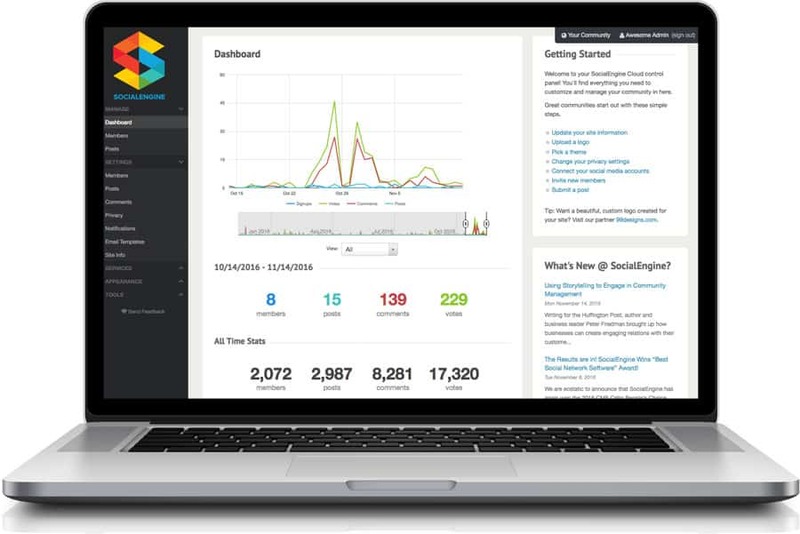 SocialEngine is a social networking web application that allows you to create and manage different types of online community. It is based on PHP and MySQL and it offers great reliability and security. The script was initially released in June 2006 and has become a leader among all of the community based web platforms available these days. Up to 2017 the application has around 10 million active installations which places it at the top ranking positions. The platform provides various built-in functionalities allowing its customers to administrate social networks of different scale. It offers great scalability, module and themes implementation, multilingual support, easy management and intuitive interface. The script is a paid one and you have two options when purchasing a license. The first one – SocialEngine PHP allows you to download the application and host it yourself – on your own server or using the services of a third-party hosting provider. The other variation – SocialEngine Cloud is a SaaS (Software as a Service) version, hosted on a server owned by SocialEngine. However, you have the opportunity to try both for free – using the 30-day trial of the PHP version, and the 14-day trial of the Cloud one. It provides you with a lifetime license for the application for the reasonable price of $299 which you will need to pay only once. You get a fully unencrypted codebase which you can use and modify depending on your personal needs. You can also switch from one hosting provider to another with ease since you have full control to all of the core files. It gives you the opportunity the built you online community directly on the SocialEngine servers with the only cost of $29/month. There is no need to worry about a hosting fees and any additional costs. However you cannot make any modifications to the application core files. As a conclusion we should point out that if you are willing to create a social networking website SocialEngine is a great tool to use, which will provide you with a whole variety of functionalities, combining a user-friendly interface and a powerful codebase. You can make different modifications and add more functionality to the script and is that way you can build the community you have dreamt of.